hrrp://www.imagemaven.com Everyone wants to stand out on Pinterest by using eye catching graphics and TALL pins. In this video Marlene Hielema shows you how easy it is to make your own stunning Pinterest graphics using software that you already have. Powerpoint or Keynote combined with iPiccy.com (free online) is all you need. You will also learn the best sizes to use for your pins. Social media interfaces change from time to time, so check the Pin width before making any graphics to share on Pinterest. I really found this video to be a great help. Do you have a video on making a Cover Photo for Etsy Store? You’re the boss of clear and useful tutorials on photos Marlene! Thanks for the tutorial! Very clear and helpful. I do have one question….in what program did you create this tutorial? Isn’t that the truth. In the meantime we’ll have to rely on the "manual" method or Photoshop Actions. Awesome video! I’ve trying to figure out for the longest how to create tall pins for pinterest! Thanks so much for providing the specific dimensions for each photo type! So I can use powerpoint for this, right? Bc what you used looks just like my windows powerpoint. And you said I don’t need the pickey site b/c I can do it on powerpoint? Right? You are an excellent teacher!!!! thank you. great info,very organized. Thank you. I never thought of PowerPoint. Many thanks. Great tutorial! Just enough technical info without being overwhelming!! Hi Marlene. I’ve watched several of your videos today on photography basics, editing etc…You’re awesome. I really like your teaching style. Very simple to understand. I actually learned somethings today. Thanks! Too bad we didn’t have more Instructors like you when I was in school many moons ago. lol. Thank you so much for putting this video together! This is exactly what I needed! Thanks a million. Such easy to follow advice. I appreciate it. This was just what I needed to see today. Big yay! Thanks for that Marlene. I will definitely reference this again now that I know where to go when I want to make a tall pin. Thanks again! I’m happy to help Monique. Hopefully Pinterest won’t change things up too much, because you know how these things can go with social media platforms. Bottom line is that you want to make sure your information is legible. Thanks for commenting. Happy Pinning! Wow, this is so easy, thank you. You have helped me so much, you have no idea! I do have one problem I can’t seem to fix on my own, though. The saved pictures are blurry. Do you know what could be the cause? Thank you so much for the dimensions! 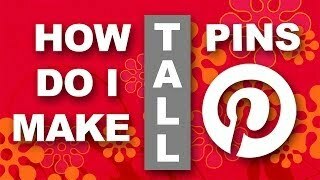 Oops how to make a tall picture for Pinterest. thanks so much! Hi, wow oh my thanks much form a fine arts person who was afraid she was going to be lost for ages in the pixel world! Thank you so much for being so generous with your time and knowledge. Just a couple of questions when you have a moment? The powerpoint or keynote, do they work on iPads? If not what do I have to use… Also, the iPiccy seems awesome,does it also work on an iPad? And thanks for doing this!! I kept seeing the online programs that cost money each month. This is a lot easier and cheaper.